Jenike & Johanson offers a free webinar on bin and silo distress. Jenike & Johanson Inc. will present a free, hour-long free webinar, Signs of Distress in Silos and Bins, Tuesday, March 13, 2018 at 2pm Eastern. Silos and bins fails with frequency which is much higher than almost any other industrial equipment. Although statistics are not available, hundreds of industrial and farm silos, bins and hoppers experience some degree of failure each year. 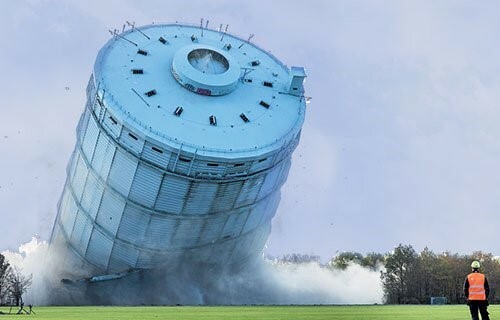 Failures can range from a small deformation in the silo/bin shell to catastrophic rupture and complete collapse of the structure. For example, cracks may form in a concrete wall, or buckles in a steel shell, either of which might appear harmless to the casual observer. However, these may be dangerous signals that might need immediate attention. These warnings need to be captured in a timely manner so corrective measures can be implemented and avoid exacerbation of the problem. This webinar will help the participants to create awareness of the "things to look for” as signs of distress in silos and bins in industrial facilities.